The Oligocene epoch is a division of the geologic time scale and the third and final epoch of the Paleogene period. It extends from about 34 million to 23 million years before the present. The Oligocene follows the Eocene epoch and is followed by the Miocene epoch. The start of the Oligocene is marked by a extinction event that may be related to the impact of large extraterrestrial object in Siberia and/or near Chesapeake Bay. The Oligocene-Miocene boundary is not set at an easily identified worldwide event but rather at regional boundaries between the warmer Oligocene and the relatively cooler Miocene. The name Oligocene comes from the Greek oligos (few) and ceno (new) and refers to the sparsity of additional modern mammalian faunas after a burst of evolution during the Eocene. The Oligocene is often considered an important time of transition, a link between "the archaic world of the tropical Eocene and the more modern-looking ecosystems of the Miocene" (Haines 1999). The Oligocene is one stage in the step-by-step development of modern life. It is also the source for a major oil reserve for Iraq and Western Iran. During the Oligocene, the continents continued to drift toward their present positions. Antarctica continued to become more isolated, and finally developed a permanent ice cap (Haines 1999). Mountain building in western North America continued, and the Alps started to rise in Europe as the African plate continued to push north into the Eurasian plate. A brief marine incursion marks the early Oligocene in Europe. Oligocene marine exposures are rare in North America. There appears to have been a land bridge in the early Oligocene between North America and Europe as the faunas of the two regions are very similar. In addition, today there are true camels in Asia and Africa and close relatives, the llamas, in South America, and the predictions of camels in North America was met when a large fossil fauna of camels found in North America (Mayr 2001). During sometime in the Oligocene, South America was finally separated from Antarctica, and drifted north, towards North America. It also allowed the Circumpolar currents to flow around Antarctica, rapidly cooling the continent. Climates remained warm, although the slow global cooling that eventually led to the Pleistocene glaciations started around the end of the epoch. Oceans continued to cool, particularly around Antarctica. Angiosperms (flowering plants) continued their expansion throughout the world; tropical and sub-tropical forests were replaced by temperate deciduous woodlands. Open plains and deserts became more common. Grasses expanded from the water-bank habitat in the Eocene, and moved out into open tracts; however even at the end of the period it was not quite common enough for modern savanna (Haines 1999). In North America, subtropical species dominated with cashews and lychee trees were present, and temperate trees such as roses, beech, and pine were common. The legumes of the pea and bean family spread, and sedges, bulrushes, and ferns continued their ascent. Important Oligocene land faunas are found on all continents except Australia. Animals grew to larger sizes than they had earlier in the Paleogene, perhaps due to more open landscapes (Haines 1999) Marine faunas became fairly modern, as did terrestrial vertebrate faunas in the northern continents. This was probably more as a result of older forms dying out than as a result of more modern forms evolving. South America was apparently isolated from the other continents and evolved a quite distinct fauna during the Oligocene. Mammals. 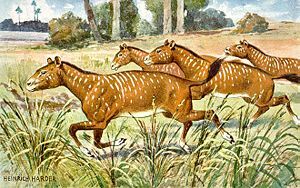 Brontotherium, Indricotherium, Enteledont, Hyaenodon, and Mesohippus are found. Reptiles. Reptiles were abundant in the Oligocene. Choristodera, a group of semi-aquatic, crocodile-like, diapsid (archosauromorph?) reptiles that had originated in the Jurassic, possibly as far back as Late Triassic, became extinct early in the Oligocene, possibly due to climate changes. Snakes and lizards did diversify to a degree. Sea life. The Oligocene oceans had some resemblance with today's fauna. Bivalves were present. The baleen and toothed cetaceans (whales) had just appeared, and their ancestors, the Archaeocet cetaceans, remained relatively common, although their were falling as the Oligocene progressed, possibly due to climate changes and competition with today's modern cetaceans and the Charcharinid sharks, who also appeared in this epoch. Pinnipeds (marine mammals such as seals, walruses, and sea lions) probably appeared near the end of the epoch from a bear-like or otter-like ancestor. Haines, T. 1999. Walking with Beasts: A Prehistoric Safari. New York: Dorling Kindersley Publishing, Inc. ISBN 0563384492. Ogg, J. 2004. Overview of Global Boundary Stratotype Sections and Points (GSSP's). Retrieved June 22, 2007.